Each Home screen page on your Android sports a grid that holds only so many app icons. Even when you can add more pages, an upper limit exists. Although you could use math to calculate the maximum number of Home screen icons, a better choice is to use app folders to avoid any overflow. An app folder is a collection of two or more apps, both in the same spot on the Home screen. 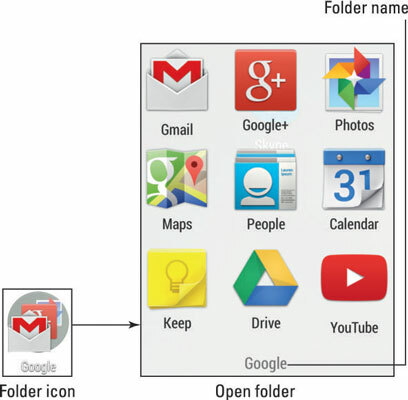 The following figure illustrates an app folder on the Home screen, shown both closed and open. Place on the same Home screen page the icons that you want to put in the folder. Long-press one icon and drag it right on top of the other icon. The folder is created. Both icon images show up inside a circle, similar to what’s shown on the left. Continue to drag icons into the folder. You can also drag an icon directly from the apps drawer. Open a folder by touching it. You can then touch an icon in the folder to start an app. Or if you don’t find what you want, touch the Back icon to close the folder. Some phones require that you long-press the Home screen to create a folder. Drag an app icon onto the Create Folder icon to build the folder. Folders are managed just like other icons on the Home screen. You can long-press them to drag them around. They can also be deleted. Change a folder’s name by opening the folder and then touching its name. Type the new name by using the onscreen keyboard. Add more apps to the folder by dragging them over the folder’s icon. To remove an icon from a folder, open the folder and drag out the icon. When the second-to-last icon is dragged out of a folder, the folder is removed. If not, drag the last icon out, and then remove the folder as described.